Mercury Games edition, English, excellent condition. 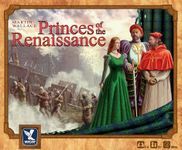 Includes the Princes of the Renaissance: Expansion Bundle, ditto. I'm arriving Saturday the 13th in the early afternoon, and sadly departing sometime Friday morning the 19th.